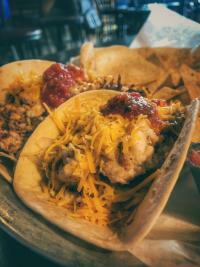 Cow Patties and Yard Birds are only two of the many clever categories a person will find on the menu after sliding into a comfy booth at Sharky’s Pub and Grub. 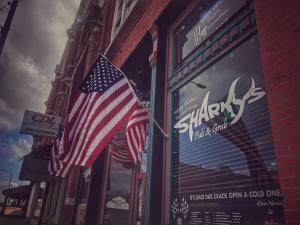 Located in downtown Fort Scott, Sharky’s brings a beachy flair to the otherwise land-locked historic streets. 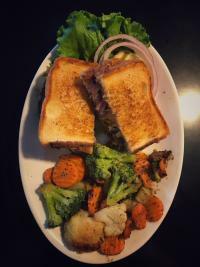 The diverse selections offer everything from comfort food like pot roast and fried chicken specials to more eclectic seafood choices. Their famous, homemade Landshark Chili is offered year round. The casual environment, chocked full of campy prints and vintage sports memorabilia, offers two levels of socializing and dining. Since it was difficult to choose only one item from the menu, I indulged in two entrees for under thirty dollars. The Cabo Fish Taco was grilled tilapia, blackened to perfection and garnished with a light jalapeno cream sauce slaw that added the right amount of crunch and spice. After that, I tried not to (but did!) devour the Queen of My Double Wide Trailer. 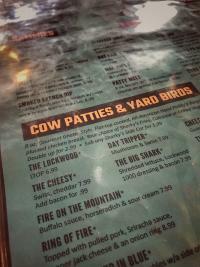 The indulgent offering included eight ounces of all-American beef cooked gourmet ghetto style on a flat-topped grill. Texas toast was the landing pad for a patty that dripped with A1 Steak sauce, grilled red onions, bacon, and cheddar cheese. 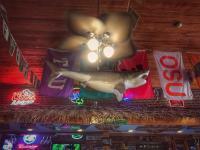 Sharky’s Pub and Grub is a great place to visit any time of the week or year. While the owner worked a catering gig in the kitchen, my friendly waitress, Megan, made me feel at home as she told me about her favorites and how much she loved working there. After eating, walking off those calories by combing the downtown and market square is a worthwhile endeavor. More than 26,000 visitors trek to Fort Scott each year—it’s a historical and photographic goldmine. After dining, I snapped photos of the stone masonry and flapping American flags. A patron introduced himself as he was leaving, and asked about my interest in the building. After telling him my mission to eat and explore all of the best places in Kansas, he encouraged me to visit the National Cemetery on my way out of town. “It will take your breath away.” He was indeed correct. Hours: Monday 11 am-11 pm; Tuesday-Thursday 11 am-12 am; Friday/Saturday 11 am-2 am; Sunday 11 am-7 pm; Lunch is served 11 am-2 pm and Dinner from 5 pm-11 pm. 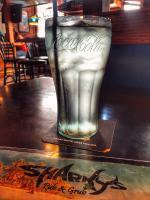 Sharky’s periodically offers live music, and their bar is always hopping--full of cocktails carefully crafted and curated like their menu. Visit their Facebook page for complete event information.